California could easily become ground zero for the immigration fight. It became a sanctuary state earlier this year, prompting a Department of Justice lawsuit alleging the state is hampering federal agencies enforcing federal immigration laws. Los Alamitos already voted to opt out of the sanctuary law. Orange County Sheriff’s Department said that not only do they support the DOJ lawsuit against California’s sanctuary status, but will publicly post inmate release dates to help Immigration and Customs Enforcement arrest illegals who shouldn’t be here. Yet, for one father the fight began almost ten years ago. Don Rosenberg of Westlake Village, California, which rests outside of Los Angeles, is not a raging Tea Party conservative. He’s a liberal. His son, Drew, was also a liberal, went to college, spent a year in London, and had visited San Francisco many times. He decided to attend law school in the City by the Bay. Drew spoke highly of then-Mayor of San Francisco Gavin Newsom. On November 16, 2010, Roberto Galo, an unlicensed driver, killed Drew in a gruesome motor vehicle accident. Galo had entered the country illegally (though the district attorney told Don that Galo had Temporary Protective Status) and had been cited for driving without a license previously. Don Rosenberg still maintains that an illegal alien, who was spared the justice of the law, killed his son. He blames Newsom, who as mayor instituted a policy of not impounding cars of those who did not have a driver’s licenses. Rosenberg's activism began with attempting to change the laws and policies regarding unlicensed drivers, particularly in San Francisco. In 2013, after speaking with Newsom's Chief of Staff at the time, Deidre Hussley, he sent Newsom a letter, which Hussley assured him would be delivered. Five years later, he’s still waiting for a response. Below is an excerpt from his letter to Newsom. The full letter is posted below. Little did he [Drew] know that a “policy” (an illegal policy at that) that you instigated just two months after he arrived would lead to his death almost to the day a year later. That “policy” of course was your decision to stop impounding cars of unlicensed drivers. At 5:30 P.M. on November, 16, 2010 Roberto Galo, an unlicensed driver, made a last second left turn at the corner of Harrison and 16th street. Drew who was coming home from law school on his motorcycle collided with the front corner of Galo’s car. As it was rush hour Drew was going about 10 MPH. Galo, who had been at a complete stop, only drove about 20 feet, so he wasn’t going fast either. Drew flew over the front of Galo’s car. Galo, instead of stopping, accelerated and drove over Drew’s body. His helmet had come off and lodged under one of Galo’s tires, stopping his forward movement. He then backed up, driving over Drew a second time, and then trying to flee drove forward again. A driver had gotten out of his car and stood in front of Galo’s. Only then did he stop. His tire was on Drew’s abdomen and five men had to lift the car off of him. We were told the next day that Galo was here illegally but a few days later we were told that he was in the country legally. Actually, he was in the country under Temporary Protective Status (TPS), but I was never told that by the DA’s office. We were also told that he had been stopped a few months before for driving the wrong way on a one-way street, driving without a license and driving without insurance. We were told that his car was impounded but that he got it back the next day. I asked the DA’s office for months how that case was adjudicated. It took months to get an answer. At his hearing in late July 2010 (after he had been driving again for 45 days) the driving without a license and without insurance charges were dropped in return for him pleading guilty for driving the wrong way on a one-way street. What a tough deal that must have been to negotiate. The DA’s office to this day refuses to tell me if he ever paid the ticket. The full story is enclosed in a document entitled “My Story” so I won’t go into all of it here, but let me add one more thing. He was eventually convicted of vehicular manslaughter and driving without a license and sentenced to six months in jail. He served 43 days. Once I found out he was in the country legally - which meant he was eligible to get a driver’s license - I immediately told the ADA on our case that there is a reason he doesn’t have a license and it is important to know what that reason is. After bugging her for months she told me that DMV wasn’t responding to her. I kept badgering her and she told me about a month later that DMV didn’t keep records on non-licensed drivers. I knew that she was lying and had that confirmed months later when I spoke to a high level DMV director who told me that they basically kept records in perpetuity. She told me that if he had failed the test that would remain on his record until he passed. Of course because of privacy reasons she couldn’t tell me what, if anything, was in his file. The afternoon after Galo was sentenced I found out that he had failed the driving test twice before he was caught in June 2010 and then once more before he killed my son. I was also told by the new ADA on the case that it took him one phone call and 5 minutes to get that information. So you drive without a license, fail the test twice and when you’re caught the charges are dropped. Rosenberg makes it clear he’s not immigrant bashing. This isn’t about the immigrant community; it’s about the illegal immigrant community and the hurdles he had to go through just to get some basic answers from the DMV. Someone who reportedly was not supposed to be here killed an American citizen—and the state made it difficult for a grieving father to find answers. Today Newsom is lieutenant governor of California and seen very much as the successor to Jerry Brown. Newsom has now taken a different attitude towards ICE, calling the agency chief, Thomas Homan, an “A-plus prick,” even though as mayor he referred illegal aliens who were minors to ICE. 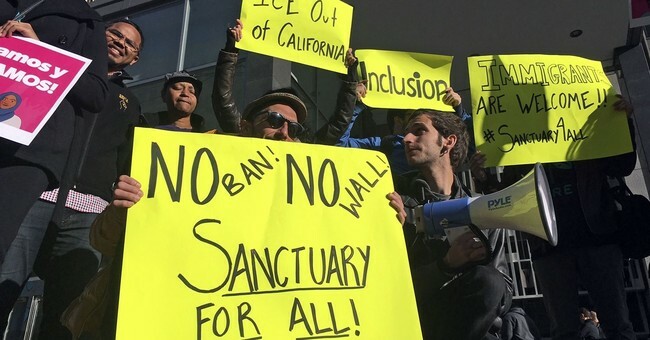 Even after the San Francisco Board of Supervisors voted to adjust the policy to refer those illegal aliens who were minors to ICE upon conviction of a crime in 2009, not a merely for just an arrest, Newsom simply ignored them. I’m trying to stop this from happening to other people,” Rosenberg said of losing his son Drew, a street-savvy law-school student who took a keen interest in news and politics like his father. This issue is one of many that have exposed how far left the Democratic Party has become; a) they don’t understand that for many of these families who had loved ones killed by illegals, these people would still be alive if political correctness didn’t get in the way of enforcing the law; b) what’s so controversial about deporting people who shouldn’t be here? This isn’t a game of running bases; you just don’t get to be safe and live here just because you evaded authorities at the border. The law says you have to go. 1.The re-establishment of local law enforcement working with ICE (repeal of Sanctuary laws) when they arrest someone suspected of being here illegally. 2.If this person is an illegal alien, the call to ICE is a no longer a political treacherous endeavor. Local agencies, like the DMV and local county registrar of voters, are also contacted. 3.The abolition of driver’s licenses to those who can’t prove their legal status. 4.Only citizens can vote in elections, with registration forms verifying citizenship under penalty of perjury. 5.The county must save evidence of citizenship for new voters for at least four years. These are hardly controversial provisions. We’ll see what happens. While the state of California keeps fighting those victimized by illegal aliens, Mr. Rosenberg and Fight Sanctuary State are carrying on with their agenda to ensure that federal immigration laws are enforced and honored. In August 2009, my son moved to San Francisco to begin law school. Although he grew up in Westlake Village, attended college in Arizona and lived in London for a year he visited San Francisco many times as many of his friends went to undergraduate school there and many remained to live and work. Having grown up in an extremely liberal and political household the politics of San Francisco were not a concern for him and was actually a selling point. In fact, he thought you were a great mayor and sometime after he moved there he sent me a very positive article about you in one of the city papers. He was also excited when he heard that you were going to run for governor. Little did he know that a “policy” (an illegal policy at that) that you instigated just two months after he arrived would lead to his death almost to the day a year later. That “policy” of course was your decision to stop impounding cars of unlicensed drivers. At 5:30 P.M. on November, 16, 2010 Roberto Galo, an unlicensed driver, made a last second left turn at the corner of Harrison and 16th street. Drew who was coming home from law school on his motorcycle collided with the front corner of Galo’s car. As it was rush hour Drew was going about 10 MPH. Galo who had been at a complete stop only drove about 20 feet so he wasn’t going fast either. Drew flew over the front of Galo’s car. Galo instead of stopping accelerated and drove over Drew’s body. His helmet had come off and lodged under one of Galo’s tires stopping his forward movement. He then backed up driving over Drew a second time and then trying to flee drove forward again. A driver had gotten out of his car and stood in front of Galo’s. Only then did he stop. His tire was on Drew’s abdomen and five men had to lift the car off of him. We were told the next day that Galo was here illegally but a few days later we were told that he was in the country legally. Actually he was in the country under Temporary Protective Status (TPS) but I was never told that by the DA’s office. We were also told that he had been stopped a few months before for driving the wrong way on a one way street, driving without a license and driving without insurance. We were told that his car was impounded but that he got it back the next day. I asked the DA’s office for months how that case was adjudicated. It took months to get an answer. At his hearing in late July 2010 (after he had been driving again for 45 days) the driving without a license and without insurance charges were dropped in return for him pleading guilty for driving the wrong way on a one way street. What a tough deal that must have been to negotiate. The DA’s office to this day refuses to tell me if he ever paid the ticket. The full story is enclosed in a document entitled “My Story” so I won’t go into all of it here but let me add one more thing. He was eventually convicted of vehicular manslaughter and driving without a license and sentenced to six months in jail. He served 43 days. Once I found out he was in the country legally which meant he was eligible to get a driver’s license I immediately told the ADA on our case that there is a reason he doesn’t have a license and it is important to know what that reason is. After bugging her for months she told me that DMV wasn’t responding to her. I kept badgering her and she told me about a month later that DMV didn’t keep records on non-licensed drivers. I knew that she was lying and had that confirmed months later when I spoke to a high level DMV director who told me that they basically kept records in perpetuity. She told me that if he had failed the test that would remain on his record until he passed. Of course because of privacy reasons she couldn’t tell me what, if anything, was in his file. The afternoon after Galo was sentenced I found out that he had failed the driving test twice before he was caught in June 2010 and then once more before he killed my son. I was also told by the new ADA on the case that it took him one phone call and 5 minutes to get that information. So you drive without a license, fail the test twice and when you’re caught the charges are dropped. You not only set this “policy” in motion but you hired George Gascón for Police Chief and you then appointed him to fill DA Harris’s position when she was elected Attorney General. You and many others are as responsible for my son’s death as Roberto Galo. You and many others are responsible for the death of many other people at the hands of unlicensed drivers and thousands of injuries and tens of thousands of collisions. Of course the question is why would you do this? 1. Kindness and a big heart – People feel the plight of illegal aliens and want to make their life better. 3. Ignorance – This wouldn’t be the first time that a decision was made without doing any research or thinking about the repercussions from those actions. I won’t attempt to classify your reason except to say everyone else I’ve dealt with from the California Legislature to the LAPD has succumbed to political pressure. This isn’t to say that these people aren’t kind but they were either already aware of the dangers, should have been aware or were definitely aware after my presentations. Let’s look at some of the statements made by you, Gascón, police spokesperson Mariles and some anonymous police when you initiated this “death sentence” for so many. • Acknowledged the policy arose out of immigrant community concerns, including financial hardship. • “These are the same people who are sailing through stops signs and injuring people’, said one traffic cop who asked not to be named for fear of retribution. (c) (1) If a driver is unable to produce a valid driver's license on the demand of a peace officer enforcing the provisions of this code, as required by subdivision (b) of Section 12951, the vehicle shall be impounded regardless of ownership, unless the peace officer is reasonably able, by other means, to verify that the driver is properly licensed. Prior to impounding a vehicle, a peace officer shall attempt to verify the license status of a driver who claims to be properly licensed but is unable to produce the license on demand of the peace officer. No, he felt that it was “the right thing to do”. Screw the fact that it was/is illegal. You think we need to balance the immigrant communities concerns. What other laws is it okay for them to break so as to balance their concerns? How many law abiding people’s injuries and deaths are acceptable to balance the immigrant communities concerns? And don’t blame this on the immigrant community. You are talking about the illegal alien community. You rejected the idea that the new policy would allow undocumented immigrants to flout the law. The recidivism rate is over 90% and there are estimated to be over 1.2 million illegal alien drivers. Would you like to retract that statement? “Changing the policy – for 20 minutes –to me is not skirting that.” It’s not the 20 minutes. It’s the fact that the unlicensed driver is getting right back behind the wheel as soon as the police leave. The person who comes to get the car parks his car a few blocks away and walks to pick up the unlicensed drivers car. He then drives back to his car and the unlicensed driver drives away. “The issue is being blown out of proportion” Will you say that to my face? Gascón recognizes that this is a problem within the Hispanic Community, where people working here can’t get a driver’s license because of their immigration status. What’s wrong with that statement? Well first don’t blame the Hispanic Community. Blame the illegal alien community. Second, those people aren’t allowed to work here. But the main issue is they can’t get a license to drive because it’s against the law. And he’s the police chief and now the District Attorney. Gascón said, “We’re stopping them from driving” Is he a fool or does he think everyone else is? The new policy should “discourage unlicensed drivers from fleeing the scene.” I’m also enclosing a story that was published in LA Weekly last month. The story is about how in Los Angeles in 2011 the rate of hit and run injury collisions was 48% compared to a national average of 11%. They used statistics that I got from LAPD. Do you think San Francisco is any better? In what could be one of the dumbest statements ever made by a police chief and should have gotten him fired (instead you made him the DA) Gascón said the new policy, “has nothing to do with immigration per se as it could apply to people who can’t afford to get a license or undergo driver training.” Well of course it has everything to do with (illegal) immigration. But that’s not the dumb part. No, it’s not dumb it’s outrageous and insulting. The cost of a driver’s license is $31 for five (5) years. If you can’t afford that how can you afford to drive or buy insurance, even at the minimum level which is essentially worthless? The next part is doubly outrageous and insulting. In case you didn’t know there is no requirement to pay for drivers training. Anyone with a license over 18 can train you. But that’s not the worst part. Even if you had to pay for driver training the chief of police is saying even if you don’t learn how to drive it’s still okay to drive. And you were okay with that? “If they don’t learn their lesson and repeat offend the car will be impounded”. Call your buddy George and ask him how many cars from repeat offenders have been impounded since this policy began. As you will see in the new DMV study released on December 20, 2012 unlicensed drivers frequently give fake names when caught so they never show up as repeat offenders and since San Francisco’s policy is to never prosecute unlicensed drivers (until they kill someone and even then not always) they never know who it is they are issuing a citation. In fact I have been told by various police in San Francisco that most of the time they never pay the ticket because there is no way to trace a fake name and a fake address. I know in Los Angeles there are over 1 million warrants for failure to pay these tickets that match up to no one. Police spokesperson Mariles said that this wasn’t a policy about undocumented residents, it’s about unlicensed drivers. Yes and Virginia’s trans vaginal probe law isn’t about women, it applies to everyone. In February 2012 a bicyclist killed a 72 year old man. Gascón got personally involved in the case (he’s refused to ever speak to me and my wife). He said there would be a crackdown on bike riders and that, “the rules of the road apply to everyone”. In 2011, 899 pedestrians were hit by automobiles. Bicycles hit 17 people. San Francisco has the highest per capita pedestrian collisions, the highest per capita pedestrian death and the highest per capita auto collisions and fatalities in the state. Are cars being impounded? Are unlicensed drivers being prosecuted? I think not. Mariles acknowledged that the policy arose out of community concerns, including financial hardships. So we jeopardize public safety for all because people who have already broken the law coming here have financial hardships. I pay taxes so their kids can go to school. I pay taxes so their kids (and them) can get medical attention and then you let them kill my son because they have financial hardships? And the topper of them all. This one is so good that LAPD chief Charlie Beck is even using it. “But we think this is definitely a way to ensure better, safer streets.” Of course when I asked Charlie how allowing unlicensed drivers to drive makes the streets safer he refused to answer. So let me ask you. How does allowing people who have never demonstrated knowledge of our driving laws, many of whom can’t speak English and read the traffic signs and none of whom have been eye tested to see if they can even see the signs possibly make the streets safer? And last but certainly not least. “And we think it’s progressive, we think its forward thinking, and we think other (police) departments will take notice. Well here’s what I know. It is pandering to a specific group to garner votes. It’s so forward thinking that we should also dissolve the DMV. Everyone hates them anyway and think of all the money we would save. And many police departments have taken notice and have adopted the same policy. Maybe that is why California was one of the few states that actually had an increase in traffic fatalities in 2011. When I first testified in Sacramento in July 2011 against “One Kill” Gil Cedillo’s bill to stop impounding cars of unlicensed drivers at sobriety checkpoints my focus was on public safety. I didn’t want this discussion to turn into immigrant bashing. The Public Safety Committee (or should I say the Democrats on the Committee) did not give a damn that my son was killed. All they cared about was the sob story from an illegal alien who had his car impounded and lost his job. They listened to every lie spewed by Cedillo and passed the bill. Jerry Brown signed it. I then went to testify in front of the LA Police Commission. Commissioner John Mack had the audacity to say to me, “Have you no compassion”. I never started to research illegal unlicensed drivers. I started at unlicensed drivers and it took me to illegal aliens. I have been a liberal my whole life (much longer than you). This tragedy has not changed my politics. However, I have never been an ideolog. Just as the Tea Party and many Republicans refuse, despite all of the evidence, to accept global warming I will not refuse to see the dangers caused by illegal aliens despite all of the evidence which extends way beyond driving. From everything I knew about you prior and my son’s affection for you I believe you are a good man who truly has some forward thinking visionary ideas. I would have supported you over Jerry Brown in a second. I said I wouldn’t classify your reason for making this decision but I will. I believe like everyone else you took that position for votes. You knew you were going to run for governor. Kamala Harris supported it because she knew she was running for statewide office and Gascón was probably thinking (and still is) of running for mayor. Although it’s certainly a character flaw I will assume you didn’t get any statistics or research before you made your decision. If you did and made the decision anyway this whole letter has been a waste of time. So you owe me a debt you can never repay. My son is dead and nothing will bring him back. As I have said to that rotten DA’s office in San Francisco, “You will not make my son a statistic”. I have been active in trying to get the laws enforced for one reason and that is to try and save other lives and the pain and suffering my wife and I, my other two children and my son’s girlfriend (to have been his fiancé after law school) will endure for the rest of our lives. I’m doing this because had someone else taken a stand before November 16, 2010 my son might be alive today. If you are the man I think you are you will contact me and help me fix the deadly mess you helped create and perpetuate. You should know that I have worked closely with Senator Pavley’s office. They have been wonderful. Ex-Assemblywoman and unfortunately my new congresswoman Julie Brownley and I are not on speaking terms anymore. My ex-Congressman Henry Waxman has been helpful and I have also met with Congressman Adam Schiff. Adam was an ex-federal prosecutor. He examined the record of how the San Francisco DA’s office handled this case. His response in writing, “The way your son’s case was handled in SF is beyond appalling”. If you read “My Story” you will see why. Despite San Francisco’s leadership in collisions and deaths last year Assemblywoman Ma introduced a bill to stop impounding cars of unlicensed drivers for almost any reason. I testified against that bill in front of the transportation committee. When Chairman Desaulnier asked her if she was aware of the latest AAA study (also enclosed) she said she had never seen it. Fortunately, the committee defeated the bill although almost no one is impounding cars in California anymore anyway. Senator Pavley’s office hand delivered two letters to your “good friend” Jerry Brown. He refused to even acknowledge them. I have written to Kamala Harris three times. The first letter took 8 months to get a response that at best was insulting. The second letter was never responded to and the third hand delivered by Waxman’s office this past September has never been responded to. I have enclosed them all. I could bury you in case after horrible case of people getting killed not only by unlicensed drivers but repeat unlicensed drivers. Over 7,000 people a year are killed by unlicensed drivers in the United States. While that also includes people with suspended and revoked (S/R) licenses, as I have been told by many police and some DA’s, “How can we crack down on them (S/R) when we do nothing to the people who drive without a license”. Unlicensed driver deaths are second in number to drunk driving deaths but while drunk driving deaths are declining unlicensed driver deaths are not. In fact on a per capita basis unlicensed drivers kill more people than any other crime in the United States. Since the massacre of 20 children and 6 adults in Newtown on December 14, 380 people have been killed by unlicensed drivers. About 75 were children. A few weeks ago, speaking about marijuana you said, “These laws just don't make sense anymore. It’s time for politicians to come out of the closet on this." It is. It’s also time for them to come out of the closet and demand and strengthen the laws on unlicensed drivers.